One of the unique and endearing aspects of baseball is that, unlike many other popular sports, it does not operate on a clock. Mandate that runners go two bases on all singles to the outfield. This directive promotes quick reads and potentially more runs, whereas delayed reads result in only one-base advancement and no runs. When setting up a hitting rotation, cover as many of the six elements of offense as possible. The focus should be strictly on offense; do not use a defense. Valdosta State University hitting coach Todd Guilliams brings his record-setting hitting expertise to High-Scoring Baseball, the most comprehensive resource available about the offensive side of the ball. 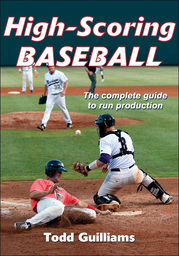 Geared toward generating higher run production, the book includes drills to improve every offensive aspect of the game. Coach Todd Guilliams joined the staff of the Valdosta State University baseball team in 2008 and helped orchestrate one of the top 10 turnarounds in the country in Division II, taking the Blazers to a 36-18-1 record in 2008 and following up with a 43-21 mark in 2009 and a 43-17 record in 2010. As the team’s hitting and catching coach, Guilliams has put together one of the most prolific offenses in Valdosta State history, breaking the school record for batting average in 2010 with a .351 mark. In 2009 the squad led the nation and set a Valdosta State record with 113 home runs, ranking fourth in NCAA Division II history while finishing eighth nationally for the season with 578 runs scored. Before joining Valdosta State, Guilliams helped his brother Greg build a dynasty at Embry-Riddle, where the program won 622 games against just 228 losses, making six NAIA World Series appearances in the process. He served as the team’s hitting, catching, and outfield instructor, which produced 44 NAIA All-America selections. In the 15 years that Guilliams coached at Embry-Riddle, it was the winningest baseball program at any collegiate level (junior college, NAIA, Division I, or Division II) in the state of Florida. His run at Embry-Riddle was briefly interrupted as he spent the 2000 season as an assistant with Dallas Baptist. During his year with the Patriots, the team registered a 43-23 record and advanced to the NAIA World Series, where it finished as national runner-up. Guilliams began his coaching career as a graduate assistant at Eastern Kentucky University in 1989 and 1990. The Colonels won an Ohio Valley Conference championship in 1989 and posted a 42-15 record in 1990. He spent three seasons as an assistant coach with the Staunton Braves in the Valley League from 1990 to 1992. Throughout his 28 years in college baseball he has authored articles published in College Baseball Digest and twice has been a featured speaker at the American Baseball Coaches Association national convention. He’s also made presentations at high school baseball coaches association clinics in Georgia, Alabama, and Ohio. "Successful coaches have a philosophy that guides them and defines their teams. Todd Guilliams epitomizes the role of a coach and shares his expert knowledge of the game in High-Scoring Baseball."